Your attention and involvement are more imperative than ever. Let elected officials and appointees know where you stand on public education. Know who is on the state education committee and educational adviser to governor. Put everyone who represents you on your contact list on your phone--elected leaders from the school board to members of Congress. Attend the next school board meeting; see how decisions are made. Communicate with members. Stay informed on political and legislative values which affect education. Read the emails and Calls to Action which Director Kreider sends. Strengthen school-community connections. Invite education leaders to speak to church or community groups. Develop Speakers' Bureaus within your units and let the community know about the availability. Create a Public School Defense Team. Have several means of communication. Provide updates on local issues. Host community teach-in on dangers of turning over public school dollars to private schools. Decide what sources of information you believe are credible. Know who is a trustworthy and independent watchdog. Find allies on social media. Know how you will respond to issues and legislative action. Let friends on social media know IF an elected official responded or IF they didn't deliver on an action. Keep the pressure on. Publish a Letter to the Editor. Be an ACTIVIST--no matter where you are on the political spectrum. The best way to reduce anxiety is by stepping up to action. PRIORITY #1 - MRTA opposes SB 747 (Emery R-31). This act provides that statewide elected officials and members of the General Assembly serving for the first time on or after January 1, 2019, shall participate in a 401(k) defined contribution plan instead of the current defined benefit plan (DB). Comment: This does not include educators at this time. It is only one amendment away if this bill is not stopped. DB plans are a proven better use of tax dollars and provide for better retirement security. PRIORITY #2 - MRTA supports full funding of the Foundation Formula and opposes the use of public tax dollars for private schools. The Missouri Constitution mandates adequate funding of K-12 education through HB 2 which requires education funding as the second priority of state expenditures. Comment: Due to several tax cuts enated by the legislature over the past few years, general revenue is expected to be reduced significantly. 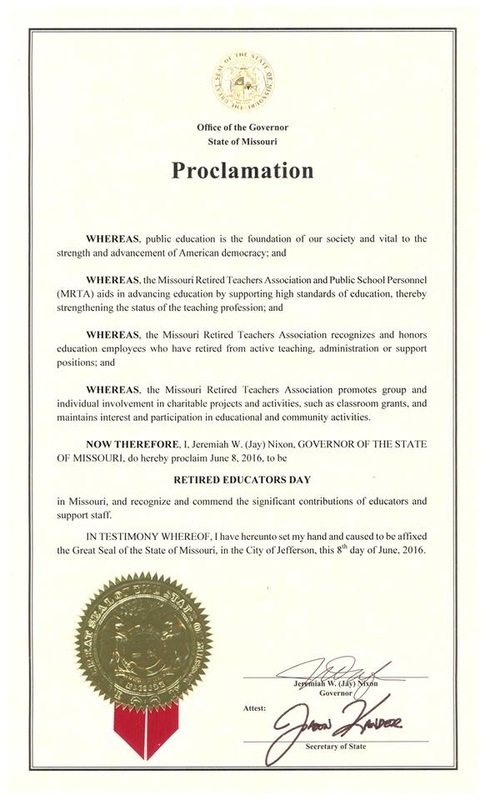 MRTA asks funding for Public Education be the priority. PRIORITY #3 - MRTA opposes HB 2247 (Roeber R-34) and SB 618 (Eigel R-23). This legislation allows for the expansion of charter schools statewide. Comment: Charter schools take scarce tax revenue from public education. Currently, charter schools are only allowed in Kansas City and St. Louis City. NOTE: The House Elementary and Secondary Education Committee has just voted out HB 2247, a charter school expansion bill by a vote of 7-6. MSBA opposes the bill. PRIORITY #4 - MRTA opposes HB 2188 (Matthiesen R-70), SB 612 (Koenig R-13), and SB 565 (Emery R-31). These acts establish the Missouri Empowerment Scholarship Accounts Program. Comment: These are voucher schemes which create a new 100% tax credit allowing up to $50 million per year of state revenue to be used for privage school tuition and other expenses for students. This will result in up to $50 million per year of state revenue to be used for private school education per year. These bills take scarce tax revenue away from public education. PRIORITY #5 - MRTA opposes HJR 55 (Shumake R-5). This is a proposed Constitutional Amendment that eliminates the prohibition of public funds for the use of any religious or sectarian educational purpose. Comment: This allows for public tax dollars to be used for private schools which will take unlimited tax revenue from public education. PRIORITY #6 - MRTA supports HB 2184 (Bondon R-56) and SB 586 (Curtis D-9). These bills modify provisions relating to the Public School Retirement System of Kansas City, MO. The legislation sets the contribution rates of the employing school districts. These bills are needed to strengthen the financial health of the system, protecting employee benefits. This legislation will allow for a better opportunity for retirees to be awarded cost-of-living adjustments (COLAs). PRIORITY #7 - MRTA opposes SIR 30 (Koenig R-15). This Constitutional Amendment, if approved by voters, phases out the individual income tax and modifies the state sales tax law. The state sales tax shall be imposed on the sales and services. This is very bad for retirees very dependent upon services which will be taxed.